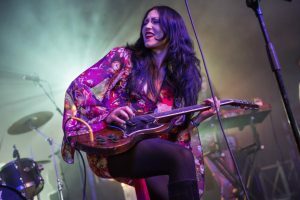 For those unfamiliar, Purson is the brainchild of singer/songwriter/multi-instrumentalist Rosalie Cunningham, who I firmly believe is one of the most exciting rock musicians to come along in ages. Their prior album ‘The Circle and the Blue Door’ was an addictive treat that refused to leave my stereo in 2013. 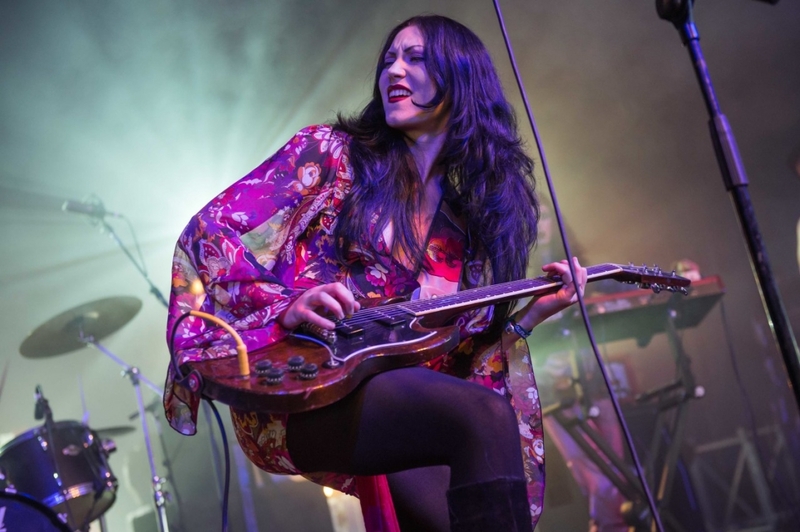 It was a refreshing blend of classic heavy rock swagger and psychedelic pop buoyed by Rosalie’s impressive vocal chops and ripping, fuzzed-out guitar work. After seeing them play a special showcase concert at The Viper Room (presented by the Classic Rock Awards) I was convinced that their potential had barely been tapped. 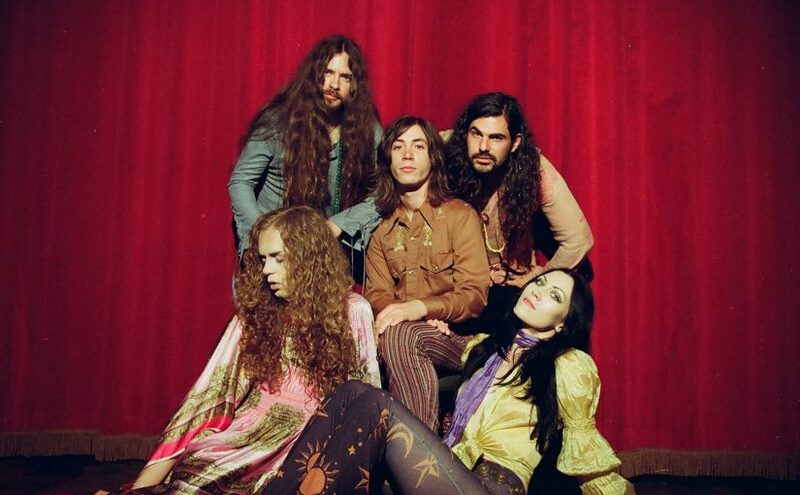 Rosalie has that indefinable magnetic quality that rock stars are made of and constant touring over the past few years has sharpened Purson into a lethal live act. 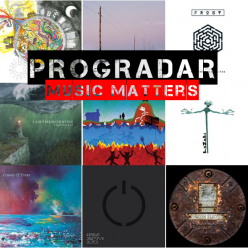 An EP (‘In The Meantime’) followed, as did a string of appearances in the UK and the US that helped garner them the “Vanguard” at the 2015 Prog Awards. It has been a long wait for ‘Desire’s Magic Theatre’, and it’s an album that has far exceeded my high expectations. ‘Desire’s Magic Theatre’ is essentially a solo album, a thematic concept composed, arranged and produced by Rosalie. She handles all the vocals, electric & acoustic guitars, bass guitar, keyboards and additional percussion, in addition to co-designing the artwork (along with touring keyboardist Sam Robinson) and mix (with Ed Turner). Drummer Raphael Mura is featured on the entire album along with guest spots from guitarist George Hudson (3 tracks), bassist Justin Smith (2 tracks) plus fine support from session players Anna Scott (cello) and Jon Seagroatt (saxophone & flute). The album is a quantum leap forward in maturity, conception and execution to their prior releases and really showcases what a unique experience they have to offer. It’s a witchy brew of late 60s influence filtered through an immensely talented and personal songwriter, one whom at age 26 seems mature far beyond her years. 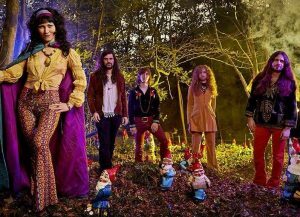 Rosalie has stated the album was primarily conceived in the vein of early Psych/Prog albums such as ‘Ogdens’ Nut Gone Flake’, ‘Sgt. Pepper’ and “H To He Who Am The Only One’. You can also hear influences from The Doors, Jimi Hendrix, Jefferson Airplane, Jethro Tull, King Crimson and many others. But this is not 60s revivalism, it’s not pastiche, it uses the influences she grew up with to create an experience that is most definitely her own. The title track introduces the album with a slithery bump & grind groove featuring a chunky guitar & sax riff before slowing down into a mellower mid-section that goes from light acoustic folk to grandiose mellotron-drenched prog and back again. A diverse array of instrumental colors including harpsichord, flute, Farfisa and Hammond organ are expertly blended together along with a myriad of 60s production effects. The coda is a playful nod to ‘Stand Up’-era Jethro Tull with a funky walking bass groove and flute solo. The crunchy Hendrix-influenced riff of first single Electric Landlady is up next, a rousing rocker with playful drug-drenched lyrics and attitude to spare. Guitarist George Hudson joins for a tasty guitar solo trade-off, a duty he returns for on the jam-oriented Mr. Howard. These tracks are closest in spirit to their debut album which overall was a slightly heavier, less experimental affair. The album also features a couple relatively straightforward psychedelic pop tunes in the sunny jangle of The Way It Is and the utterly charming The Window Cleaner. However, the real meat of the album is the more experimental half, this is where the intricacy of the arrangements really shine. Dead Dodo Down fades in with a slinky, creepy little guitar riff and a waltz-like groove punctuated by huge fuzzed-out punctuations and a tasty little clean-toned guitar solo. As with most of the album it’s a concise statement, just 3 minutes but manages to contain a wealth of detail. Pedigree Chums is a bass-driven, trippy affair that shows off drummer Ralph Mura to great effect and has a blistering saxophone solo during the outro. The Sky Parade is the centerpiece of the album, a gorgeous progressive rock epic that ebbs and flows impressively from stripped-down acoustic to full blown bombast without ever faltering. The album concludes with my two favorite songs. I Know is a haunting ballad describing the end of a love affair. It has a beautiful vocal performance from Rosalie and understated cello accompaniment from Anna Scott. The instrumental mid-section brings to mind the mellotron-fueled ballads of early King Crimson. The Bitter Suite is the magnum-opus, an immaculately arranged multi-layered epic that covers more territory in 7 minutes than many modern prog bands can manage in twice that time. It’s a fitting closer to a nearly flawless 45 minutes of music. The deluxe edition of the album contains acoustic versions of I Know and The Sky Parade and an additional track entitled Unsure Overture that is of the same quality as the rest of the album but doesn’t fit the overall concept. Guitarist George Hudson shares lead vocal duties and Anna Scott provides some Roy Wood-era ELO sawing cello to the arrangement. At this moment ‘Desire’s Magic Theatre’ is easily my favorite album of the year, a record I praise unreservedly and is deserving of wide recognition. I hope Purson becomes huge; they most definitely have the potential to do so. Buy ‘Desire’s Magic Theatre’ direct from the band.